Stage Electrics are participating in "The Gromit Unleashed" campaign which is taking place in Bristol. The company has sponsored a 5ft tall sculpture of the famous dog Gromit named "Watch out Gromit" designed by renowned cartoonist and illustrator Gerald Scarfe and is one of many such sculptures positioned across the city. Gromit Unleashed is a new ground-breaking public art exhibition hitting the streets of Bristol for ten weeks this summer to raise funds for Bristol Children’s Hospital Charity, Wallace & Gromit’s Grand Appeal. Spearheaded by Aardman, the unique art trail features 80 giant Gromit sculptures, each individually decorated by an eclectic mix of well-known and local artists, designers and celebrities. Dan Aldridge, managing director of Stage Electrics commented: "Raising funds for Bristol Royal Hospital for Children is such a worthwhile cause. Stage Electrics, as part of the creative community in Bristol, are proud to sponsor a Gromit and play our part. The Wallace and Gromit Grand Appeal have organised a truly outstanding event." In addition, working closely with SGA Productions and The Mall, Cribbs Causeway, the South West’s largest retail complex, Stage Electrics’ scenic division have recreated and built iconic "Wallace & Gromit" features for the exhibition within the newly opened flagship "Gromit Unleashed" store. The store also features merchandise and The Green Gromit sculpture designed by Zayn Malik, member of the UK’s leading boy band One Direction. With the support of tourism agencies Destination Bristol and VisitEngland, Gromit Unleashed is set to become a huge tourist attraction for the city in 2013, attracting people from the region as well as bringing national and international visitors to Bristol. 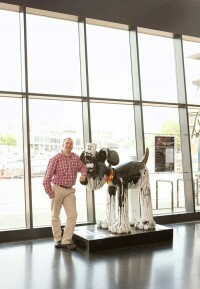 After the Art Trail which ends on September 8, the Gromits will be auctioned off to raise funds for The Grand Appeal. All the money raised will go towards supporting the expansion of The Bristol Royal Hospital for Children, one of the leading multi- disciplinary children's hospitals in the UK. In picture: Dan Aldridge, Managing Director of Stage Electrics with "Watch Out Gromit" Sculpture.